Just a few weeks after a successful Festival de la Plaisance in Cannes where Permare sold their 9th Amer 92, the Italian yard announces the sale of their first AmerCento motor yacht during the Genoa Boat Show. The AmerCento is the latest model developed by Permare and designed by Massimo Verme. Built in composite, with a length of 30.5 metres, the AmerCento is the first raised pilothouse motor yacht from the Italian yard, creating more interior volume thanks to the wide body section forward on the main deck. The interior offers accommodation for 8 guests in a full-beam master on the main deck, a full-beam VIP and two twin cabins on the lower deck. Other options are available such as four double cabins on the lower deck, or a dining area in place of the master suite. Two options are also available for the engines: twin 1,418kW Caterpillar C-32 engines, or twin 1,432kW MTU 12V 2000 M94 engines. Thanks to her hull conception, the AmerCento will reach a top speed of 29 knots, and a cruising speed of 25 knots with a long range at an economical speed of 12 knots. Special features are also available as options, including side balconies, a spa pool on the foredeck and gullwing doors in the wheelhouse. 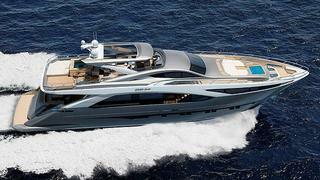 The construction of the first AmerCento has already started, and her delivery is scheduled for 2013. Barbara Amerio, co-owner of Permare, also confirmed to us that it will be possible to follow the entire construction of the AmerCento on their Twitter account (@Amer92permare), as they successfully did with the 9th Amer 92.